Trees die, just as other organisms do, and will show some definite signs when they are dying or dead. Deciduous trees, which lose all their leaves each winter, have most signs in common with evergreen trees, which never lose all their leaves at once. Deciduous trees may drop their leaves during the growing season if they are dying. 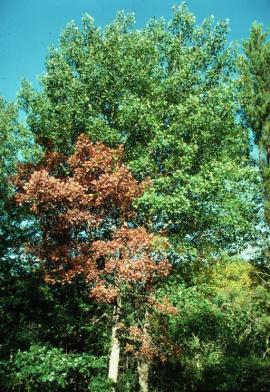 If the leaves turn brown and brittle during the growing season, the tree may be dying. Yellow leaves on a tree that usually has green leaves are also a sign of a problem. Evergreen trees will start to show red or brown needles. Once the top third of the plant has needles that are red or brown, the tree is definitely dying. Trees showing yellow needles are stressed and may be dying. When branches lose their bark, those branches are dead. A branch that is starting to lose its bark is dying. In extreme cases, branches will break off when dead. When too many of the branches break off, the tree will die. Note that some trees, such as pecan trees, are self-pruning and the lower branches will fall off when nothing is wrong with the tree. Fungus may grow on dead branches. It only grows on decaying wood, so whatever portion of the branch it is on is dead. Wood boring insects will also move in when a tree is dying. 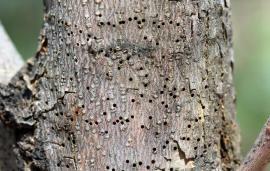 Branches start showing holes where the insects have made homes or bored holes to eat the wood. 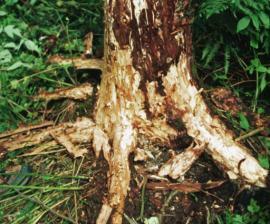 Bark will become loose and start falling off a dying tree. It may sport fungus or holes where wood-boring insects have made homes in it. Brittle bark is also a bad sign. Bark beetles indicate dying bark. Places that are bare of bark are a sign of problems. Carpenter ants are a sign of deadwood. Rows of holes from boring insects are also a sign that the tree is in trouble. Fungus on the trunk is a sign of dead and decaying wood. Roots may turn slimy when a tree is dying. They may host fungus and insects such as boring insects and carpenter ants. They may become brittle and break, allowing the tree to fall over. They may also show knots in their fine fibers. If you believe your tree is sick or dying, you need to have a certified arborist come out and inspect the tree. The arborist can tell you if the tree is sick, what is wrong, and if it can be treated or the tree needs to be removed. An arborist has more education than someone who is simply a tree trimmer and is more able to diagnose and treat trees.